Las Vegas (Etats-Unis) (AFP) - Gennady Golovkin and Saul "Canelo" Alvarez were preparing for a middleweight "war" here Saturday as the final countdown to their acrimonious rematch began. Undefeated Kazakh world champion Golovkin and Mexican idol Alvarez will climb into the ring at Las Vegas's T-Mobile Arena at around 8pm local time (0300 GMT), a year after battling to a controversial draw at the same venue. The 12-round contest is the most eagerly anticipated fight of 2018 and takes place against a backdrop of mounting animosity between Golovkin and Alvarez. 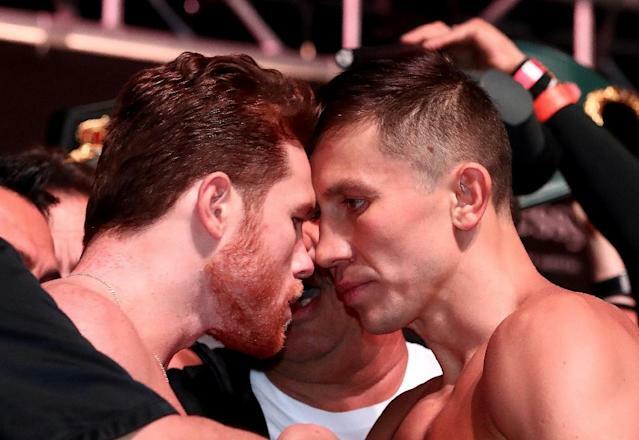 Tempers threatened to boil over at Friday's weigh-in, where Alvarez appeared to charge at Golovkin before members of the two fighters' entourages intervened. Golovkin, who could claim a piece of boxing history with a 21st consecutive defence of his titles later Saturday, appeared the more composed at Friday's face-off. "I saw he's like a clown. He is a showman. He is not true guy," Golovkin said afterwards. "This is not a regular fight, this is a special war. "All I could feel was fear from them," the 36-year-old WBA, WBC, and IBO champion added. The hard-hitting Golovkin (38-0-1, 34 knockouts) is expected to carry a slight weight advantage into the ring on Saturday. He tipped the scales at 159.6 pounds (72.4 kilos) on Friday, against Alvarez's 159.4lbs. Alvarez (49-1-2, 34 knockouts), is likely to enjoy the lion's share of support in Saturday's sold-out fight, which takes place on the eve of Mexico's Independence Day celebrations. Alvarez on Friday claimed to have "won" the weigh-in showdown. "I got excited and motivated by the fans," Alvarez said. "I won the weigh-in, and now it's time to win the fight. It's going to be an exciting fight and a big victory." The build-up to Saturday's bout has been marked by an escalating war of words between the two camps. An initial rematch scheduled for May 5 was cancelled after Alvarez twice tested positive in February for the banned substance Clenbuterol, which can help with weight loss and muscle-building. Alvarez, who was later suspended for six months, insisted the drug had entered his system inadvertently through contaminated meat he ate in his native Mexico. While there have been several cases involving Mexican athletes and drug-contaminated meat in recent years, Golovkin has rubbished Alvarez's claim that the failed tests were the result of an innocent mistake. The Kazakh fighter raised the temperature again this week, reiterating his claims that Alvarez was a drugs cheat. "These stories about contaminated meat are nonsense," Golovkin said, claiming to have seen injection marks on Alvarez's body in photos of his opponent. "You couldn't deny there was some injection marks on his hands and his arms. Injection marks were evidently there," Golovkin said. "Everywhere, biceps, stomach, pretty much all over his body you could see injection marks." Alvarez, whose only defeat in a 52-fight career was a 2013 loss to Floyd Mayweather, admits the accusations have riled him. "Those are the kicks and screams of someone who is drowning," Alvarez said of Golovkin's doping claims. "Those are the excuses that they are making because of what is coming on Saturday, which is a loss for them. "I'm bothered by all the stupid things they've been saying and I've been using it as motivation in my training for this fight." The rematch comes after last year's controversial drawn first contest. Most observers believed Golovkin did enough for victory, but Alvarez was handed a draw after a wild divergence in the judge's scorecards. One judge scored it 115-113 for Golovkin, while another had it 118-110 for Alvarez and a third scored it even. Golovkin plans to leave nothing to chance in the rematch, vowing to win inside the distance. "If Canelo gives me a chance and fights like he claims he will, I will knock him out," Golovkin said.